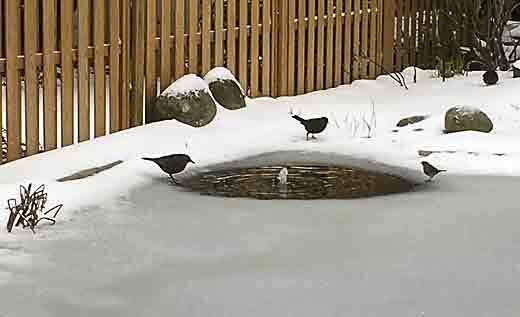 What should I do if my pond has frozen? The British weather is predictably unpredictable, so in some years the garden pond may only have thin ice cover for a few days, whilst in other years, thick ice and snow can blanket ponds for weeks at a time. For this reason there is no guaranteed best approach for winter preparations. Preparations may be over-the-top in a mild winter, or insufficient in a harsh winter. If the pond entered the winter in a generally healthy state, without an excessive build up of decaying leaves and debris on the base, and with moderate stocks of fish, there should be few problems for pondlife. Make sure that any submersed pumps are kept deeper than possible ice levels (but above debris on the pool base). Cold water usually has a good amount of oxygen dissolved in it, and any fish and wildlife, sluggish in the cold, will be using up less oxygen. In these cases the pond inhabitants should be able to cope with the surface being sealed by ice for a few days without coming to any serious harm. During shorter spells of freezing, if you have a pump or filter still running, leave them on. The water movement will help to keep an area free of ice, will maintain biological filter organisms, and will circulate the water helping to keep up oxygen levels. However, avoid excessively strong water currents as these can chill the water and may upset fish. If your filter/cascade pump can be kept running, this should provide sufficient circulation and aeration. If you have no pump running, and the surface stays completely sealed for more than a few days, problems might arise for wildlife in the pond. The oxygen levels may start to fall, and dissolved waste gases may start to build up in the water. This is especially a problem where the pond is heavily stocked with fish or frogs; has a lot of debris on the base; or has snow lying on the ice, stopping light from reaching underwater plants. Pumps, filters and UV units are less likely to suffer frost damage if they are kept running. However, in those cases where prolonged freezing (lasting many days) starts to ice up waterfalls (possibly causing water loss), you may be forced to turn pumps off. If so, drain exposed units down, otherwise water inside the units will freeze and could split the casings. Note that any biological filter which is turned off or drained in the winter can take three to six weeks to become active again when restarted in the spring. Flexible liners and plastic/GRP moulded ponds are rarely damaged by ice pressure, but concrete ponds and stone/terracotta features are more vulnerable. Placing a floating ball on the surface makes little difference. Insulating covers may help a bit, but vulnerable containers are better drained or moved to a sheltered area. If the pond smells stale after the ice has melted, carry out a partial water change using tap water conditioner if necessary. Contact Us if you would like a post-winter check-up on your fish and equipment. A small bubbling jet from the outlet of a submerged filter pump keeps an area of this frozen pond free of ice. This benefits both the pondlife, and the garden birds seeking fresh water. © 2006-2019 All images and other intellectual property rights in the contents of this Web Site belong to Aquapic / Water Garden Solutions and accordingly all rights are reserved.